Johnnie Walker, a three-year-old Golden Retriever, arrived at the Chula Vista Shelter in San Diego in serious condition. He had suffered a chest trauma and it had abscessed. The shelter did its best to clean the wound. Then he was rescued by Southern California Golden Retriever Rescue (SCGRR). Working with the Animal Medical Center in Los Angeles, JW, as he is more commonly known, underwent several surgeries and skin grafts. After being cleared by the vet he was placed in one of the SCGRR’s volunteer foster homes for recovery, which apparently also included some ball playing and frolicking with a stuffed alligator. His foster family also helped JW get over some issues he had in dealing with other dogs. His wounds healed and being in a safe and loving environment readied JW for adoption. 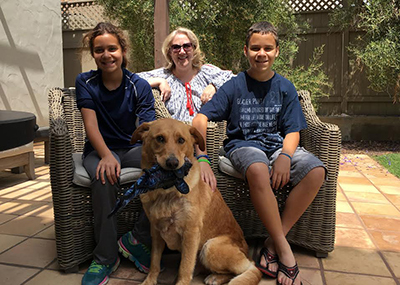 Connie, with her two children, Flynn and Sara, were on the SCGRR waiting list. They met JW in Santa Monica and after a short romp with the two kids, the deal was sealed. 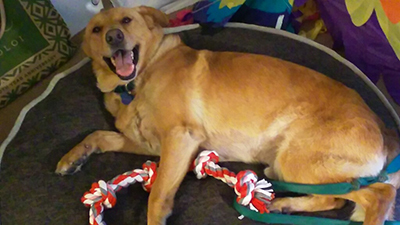 Upon his adoption, JW was the recipient of a Welcome Home Rescue Pack, courtesy of the Tess McIntyre Foundation. The rescue pack includes a bed, collar, leash and three-month supply of tick and flea prevention medication. The foundation is sponsoring a crowdfunding campaign, the goal of which is to fund 50 Welcome Home Rescue Packs. These packs help insure that rescued animals are safe and healthy as they move into their new homes. The Tess McIntyre Foundation was founded last year. It is named after Tess, a three-year-old Golden Retriever who was adopted from SCGRR. Tess was killed in an accident not long after moving into her new home. Her owners have dedicated their efforts in her memory to helping other rescued dogs. For further information, contact Bill McIntyre, founder of Tess McIntyre Foundation at bmcintyre@tessmcintyrefoundation.org or Barbara Gale, founder of Southern California Golden Retriever Rescue, at info@scgrrescue.org. Or visit the Web sites http://www.scgrrescue.org/ and http://www.tessmcintyrefoundation.org/. Please help Tess help other dogs like Cinda!